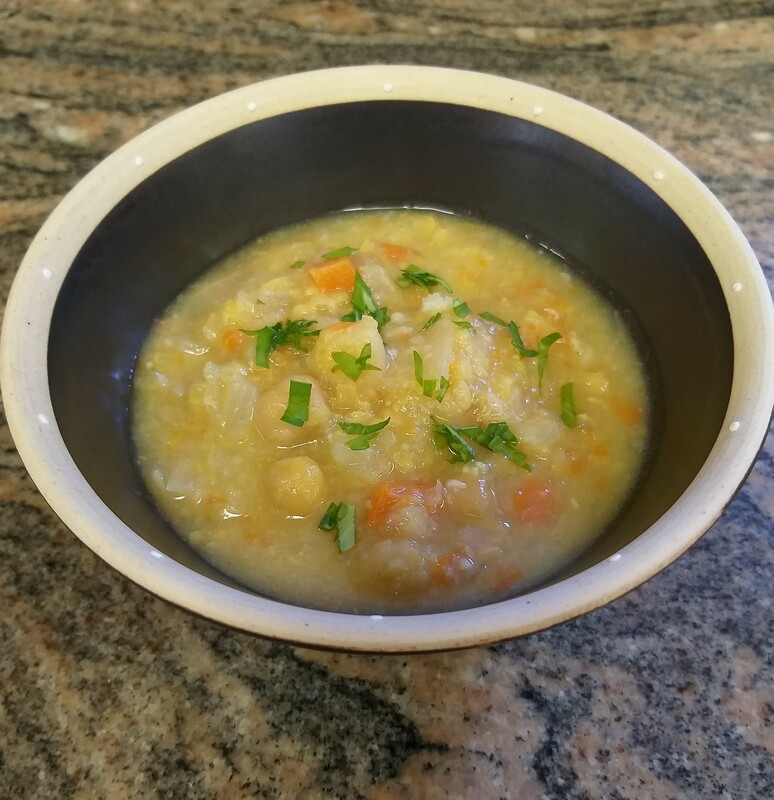 This soup was inspired by my good friend Warren Kramer who realized sauteing onion and cabbage at the start of the soup making process creates a delicious sweetness to the final dish. Give this one a try. I think you’ll like it! If using dry beans, soak them 6 to 8 hours or overnight and then discard the soaking water. Place beans in pressure cooker and add water to cover the beans. The water should be about 1 inch above the beans. Bring to a boil (uncovered). Skim off any foam and then add bay leaves, kombu and cover. Bring to pressure and cook for 50 minutes. When done, remove from heat and let pressure come down naturally. If you are under a time crunch, run cold water over the pressure cooker to bring the pressure down quicker. Place a soup pot over medium heat. When the bottom of the pot is warm, add the oil followed by the onion. Add a pinch of salt and stir so the onion is coated with oil. Let sauté for a few minutes. Add the cabbage and sauté for an additional two minutes. Layer the cauliflower, carrot and beans on top of the onion and cabbage and fill the pot with just enough water to cover the beans. Add a few bay leaves, bring to a boil, cover and simmer 20 minutes. Remove the bay leaves from the pot and using a hand immersion blender, blend the soup just enough to give it a creamy texture but not too much as you want small chunks of vegetable in the soup to provide a bit of texture. In a small bowl, place the miso paste and dilute with some water from the soup. Add the diluted miso back to the soup and bring to a low simmer. It is now ready to serve with the garnish. Enjoy!